Vintage Bollywood movie poster for sale of the old Hindi film Dhoop Chhaon (1935). 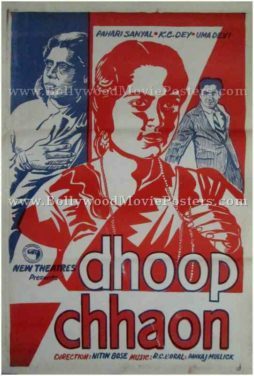 This is an actual surviving vintage Bollywood movie poster for sale of the 1935 Hindi movie Dhoop Chhaon that was produced by New Theatres, Calcutta and directed by Nitin Bose. A remake of the Bengali film Bhagya Chakra, Dhoop Chhaon was the first Hindi film to use playback singing, making this vintage Bollywood movie poster for sale highly collectible! Printed and circulated during the initial release run of the film (somewhere in the 1930s), this vintage Bollywood poster for sale was printed for publicity of the film but never ended up being used. This vintage Bollywood poster was originally designed in hand painted oil on canvas format by an art studio in Kolkata. The poster features quirky line drawn portraits of the three lead actors. As was the norm with vintage Bollywood movie posters of the era, this poster has been designed and printed using only two colors (understandably to save on design and print costs). Released in 1935, Dhoop Chhaon is credited with introducing playback singing in Indian cinema. The music of Dhoop Chhaon was composed by Rai Chand Boral (R.C. Boral). The film is remembered as a musical hit that introduced playback singing in Bollywood cinema.